The Kilnaruane Pillar Stone is a carved monolith and National Monument located in County Cork, Ireland. Kilnaruane Pillar Stone is located about 1.6 km (1 mile) southwest of Bantry, atop a drumlin, in a square enclosure in a field. A monastery may have been founded here by Brendan in the 6th century AD. The pillar was erected in the 8th or 9th century AD. The name may refer to "Church of the Romans", and a community which accepted the Roman dating of Easter, a major controversy in the early Middle Ages. The monastic settlement on the site may have been destroyed by a Viking attack. The stone is a thin schist pillar 2.1 m tall. Skin-boat carved on the SW face. a currach boat with four oarsmen and one figure steering the rowers through a sea of crosses. This could be Brendan or Cessair. Mortises on either side of the pillar were probably for attaching arms of the cross. Nearby are stone fragments, possibly a bullaun or the arms of the high cross. ^ Day, Catharina (1 January 2007). 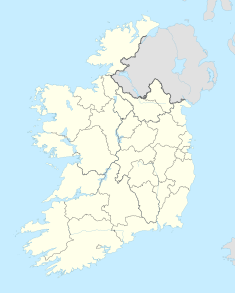 "Southwest Ireland". New Holland Publishers. ^ Johnstone, Paul (12 November 2013). "The Sea-Craft of Prehistory". Routledge. ^ Map, The Megalithic Portal and Megalith. "St Brendan's Stone (Kilnaruane)". megalithic.co.uk. ^ "The Kilnaruane Pillar Stone, Bantry, Ireland - BMD Notices". ^ "Journal of the Cork Historical and Archaeological Society". The Society. 1 January 1978 – via Google Books. ^ "Kilnaruane Stone - Museums and attractions - Bantry". ireland.com. ^ "Some Spared Stones of Ireland". irishmegaliths.org.uk. ^ McLaughlin, Barney. "Cork Cross - Irish High Crosses". irishhighcrosses.com. ^ McNally, Kenneth (2006). Ireland's Ancient Stones - A Megalithic Heritage. Appleby Press. Retrieved 10 June 2018. ^ "Kilnaruane stone - Sheep's Head Places". sheepsheadplaces.net. ^ "Kilnaruane Carved Pillar". irishantiquities.bravehost.com. Retrieved 10 June 2018. This page was last edited on 10 June 2018, at 14:43 (UTC).